Acquire the skills essential for the craft of editing. Discover how to assemble footage from various sources to create a multimedia sequence incorporating music, sound effects, voiceover, and graphics. Understand all aspects of an editor’s role in film or television production. 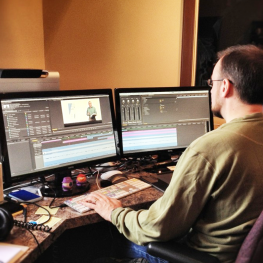 Learn to tell stories visually through the art of editing in popular editing suites. Understand the structure and responsibilities of a post-production team. Can organize and digitize data. Know how to operate a nonlinear editing system, including generation of graphics and titling, adding sound tracks, mixing, color correction, and basic special effects. Have the ability to collaborate with the director and producer in a team-based environment. Understand aesthetics and stylistic issues in editing film clips.